We've been busy... and sick. So not much has been going on around here the past two weeks. I'll post more later, but I wanted to post something today... or I might completely forget how! Ciao, and Happy New Year!!!!!! I admit it, I'm a grammar... purist. One of my favorite cartoons of all time is this "Bob the Angry Flower." I think the rules are the rules, and everyone should follow them, unless deliberately breaking the rule for effect. Like I did, up there. I also know I'm not perfect, and I make grammar, format, syntax, and every other error, just like everyone else. But at least I try. Some people don't even make the effort, and it annoys me. What annoys me even more than that are people who are proud of not knowing the rules. You know the type; they're the ones who pick on the smart kids for being smart. I found a blog a while back written by someone who clearly feels as I do. The "Blog" of "Unnecessary" Quotation Marks is, well, just what it says on the tin. I can understand why the things at Engrish.com are the way they are. It's not their native language; it's funny, but it's not their fault. The "Unnecessary" Quotation Marks thing, though... I don't get it. Which brings me to my point. Susie pointed me to this blog today, which is... well, a bit more saccharine than I care for, but that's my taste. You may love it. But it does suffer from "unnecessary" quotation "marks." Which is bad enough, except... well... I'm sorry, Sandy Toes, if you're reading this, but you were a teacher. You really should know better. It's good ta be da king! This new job is great. The atmosphere is worlds apart from the one I just left. Yeah, it doesn't hurt that I'm in charge, so I get to set the tone. But that other job? Tense much? Morale in the crapper much? It's nice to have a job, to know what that job is, and to be able to do it, without interference from above, below, or laterally. Yes, indeedy. Just needed to put that out there. I have a long commute. It's 37 miles, more or less. It takes me almost exactly an hour, door to door. Each way. Why do I drive so far? Because we have a great house in a great village with absolutely the best school ever for the kids. And I don't usually mind the drive so much. It's a nice bookend to my workday, allowing me to ramp into the day, get my schedule for the day figured out, and then, coming home, time to decompress and forget about the little annoyances. But sometimes the drive has irritants, too. Like driving itself. As you probably noticed, my average speed on my commute is... um... carry the one... about 37 miles per hour. That's partly because the last 10 minutes of it are speed-limited at 15 MPH. But it's also due to the driving laws around here, and the fact that a one-lane-in-each-direction road, with a hard shoulder, is considered a major thoroughfare. The roads here are winding. There are limited opportunities to pass (or "overtake," as they say here). And the speed limit laws don't help. 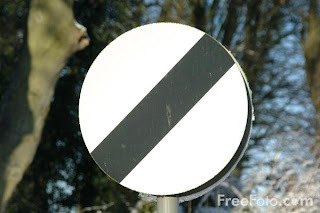 Know what this sign means? It means "The national speed limit applies here." Yep, it's a speed limit sign. What's the "national speed limit"? Well, if you lived in the US, until recently, you'd be safe in saying "55 MPH." But in the UK? You have to know the rules. Ready? All roads with streetlights are 30 MPH unless otherwise posted. Otherwise the national speed limit of 60 MPH applies. Unless you are on a "dual carriageway," which is basically any road with a median (or "central reservation." Then it's 70 MPH. Oh, wait. That speed limit is for CARS. If you're a truck or a bus, or if you're towing something, it's 10MPH lower (50 on regular roads, 60 on dual carriageways). What does this mean to me? It means that even though the speed limit is 60 for most of my commute, the traffic pattern goes like this: Truck (doing 50), followed closely someone driving a "sensible" car (Volvo) who, trying to maintain a safe distance, is doing 47. Followed by long gap, then another truck, doing 45. Followed by 3 more cars, doing 43, followed by me, doing 40. The first car behind the second truck can't pass. The next car can't pass both of them, and of course, I'm farthest back. Then a bakery truck comes roaring up behind, passes everyone on a blind curve. The second truck slows to let him in, so of course we all slow. The road straightens. Passing opportunity! Oh, wait. The Volvo won't pass. The bakery truck does, which leaves a gap for the guy behind the second truck, but the guy behind him leaps out first. He whips around the second truck; the formerly first car pulls in behind, and I finally get close enough to the truck to THINK about passing him. Of course, the road starts to wind again, and no straightaways for another 5 miles or so. Oh, and now there's no empty gap for me to pass into. Good thing I'm on my way to work. If it were somewhere I really wanted to go to, I might get really upset. Yesterday was my first day back at work after my mini-vacation. As terrible as it is to have to go to work after a long break (and we all know how that is!) it was actually pretty nice. I had put in for a new job before we left, and while we were away I found out that I had gotten it, so yesterday was my first day in my new workcenter. It's especially nice for me because I'm actually there to be the new boss. My new boss is very different from my old one, and it certainly changes the atmosphere in the office. It's a good feeling to know that he's going to be supportive as I get the feel of the place and the way I think it should run. The other thing is that there's an almost total personnel change in the office, so we really are going to get to set our own tone, as opposed to "more of the same." "So I got that goin' for me. Which is nice." Apparently my ficlet stories were so good, Ficlets.com has reached perfection. Because they're shutting down. Susie and I had a very nice day out today. We managed to arrange for a sitter (our friend Ruth) to pick the kids up from school and stay with them until bedtime-ish, and we took the train into Cambridge. The main purpose of the trip was for me to get a replacement battery for my laptop, do a little shopping, and perhaps see a movie. We had a great lunch Wagamama, a nice noodle place, and managed to walk right into the theater in the middle of the trailers. We saw Quantum of Solace, which I give 4 stars out of 5. Daniel Craig as Bond carries the movie; I found the plot a bit thin. Yes, thin, and yes, I know it's a Bond movie. In other news, the "near disaster" with the Christmas present I mentioned the other day... I have Susie's permission to tell: Lily's biggest consistent desire for Christmas has been for a goldfish. So yesterday we went out and got "My first fishtank." And 40 minutes after paying for it, as Susie was trying to juggle packages and get the door to the house open... she dropped it. And smashed it. She was pretty upset at herself. So I drove back to the pet shop, and told the manager what had happened. He grinned and made a joke which, due to his regional accent and the speed of his speech, I didn't understand. I laughed sheepishly, though, and agreed with him. And he handed me another fishtank, saying, "Don't drop this one, now." I thanked him profusely and went back home to a much relieved Susie. Thanks to Pets At Home in King's Lynn. They had no reason to help me out, but the goodwill they generated (and the word of mouth I'll spread around) was obviously worth more to them than the loss of an inexpensive starter fishtank. Rock on. One last thing; a favor. If you're reading this, would you mind leaving a comment, and letting me know who you are? Especially if you know me? You can see that hit counter thingy over there; it tells me where people are from, and I know people in some of those places. It would be nice to know who's reading me. Please? That's right. NaBloPoMo is over. I've got the spiffy badge over there and everything. That means I don't have to post every day anymore. But I can if I want to. So I am. Not that I have anything particularly exciting to write about. We just about finished our Christmas shopping today. There was a near disaster involving one gift, but we'll discuss that at a later time. David came home from school complaining of a headache, so we had him lie down a while on the sofa, gave him chicken noodle soup for dinner, and sent him to bed early. Lily's fine, except, of course, her waffles were "too crispy." Sigh. Did you know that waffles have "crusts," like bread? Yep, apparently so, because Lily left the edges of her waffles. Yes, we had an eclectic dinner today, mostly because of David's not feeling well. He had soup, Lily had waffles, and Susie and I had leftover pizza from our lunch out. We'll save the tomato soup and grilled cheese (one of my favorites!) for tomorrow. Yep, like i said, nothing exciting to talk about.